Thank-you for welcoming me here on this glorious Palm Sunday, the day when Jesus was welcomed like a King into Jerusalem, less than a week before his death and rebirth. On this day, I am considering Christ’s prescriptions about what it means to lead a good life and to be transformed/reborn/resurrected. Why did Jesus choose the phrase, “I was in prison and you visited me”? At first glance it appears to be out of place. We have all fed the hungry and clothed the naked, taken in strangers, or looked after the sick. It is easy to do. Who would not share their food with a hungry child who approached you begging? ….But, who among us have visited in prison? It is not so easy to do. Prisons and jails are not easily accessed, they are out of the way and there are barriers to visiting. They also require more than giving things. They require us to give of our deepest self. Do not let these barriers dissuade you, the visit will be transformative. When I was three, my father was imprisoned. He had a drinking problem. He went to a convenience store, stole some beer and money from the cash register. He was also the breadwinner in our family. His imprisonment meant that we had no income and were soon homeless… My mother was now a single parent of four children under the age of 5. We were lucky. My uncle, a farmer, offered us a small plywood trailer that he used to travel to county fairs as our new home. It had a set of bunkbeds. My sister and I slept on the top bunk each of us at either end. My mother slept with my two little brothers in the bottom bunk.It was without running water, but did have electricity and an outhouse. Before winter set in we were able to move to a small house that another uncle owned and rented. While Dad was in jail, my parents divorced because my dad was also violent when he drank. These events shaped who I am. When a parent goes to jail, it is a public event. I grew up believing everyone knew, but trying to hide it just the same. We carried, I carried that shame. When you visit jail or prison, you will find people of all colors, religions, and creeds…but mostly you will find the poor, the mentally ill, the abused, societies cast-offs. At a recent meeting of inmates at Maine State Prison the speaker asked those who had not had a court appointed lawyer to raise a hand. In a room of over 40 people only three raised their hand. Only three people in the room were deemed to have adequate resources to pay for their own attorney. This week, you may or may not have seen a report from the 6th Amendment Foundation(the 6th amendment guarantees the right to an adequate defense)which was presented to the Judiciary Committee of the Maine State Legislature. The report gave a scathing inditement of Maine’s indigent legal defense system, saying in some cases it completely failed its constitutional requirements and was ripe for a class action lawsuit. In most jails, 70%-80% are awaiting trial, too poor to pay bail. Not yet found guilty of anything, they will likely lose their jobs while they await trial. Others are serving time because they are too poor to pay their fine. The United States has the highest incarceration rate in the world. …higher than Cuba, higher than Russia, higher than Iran. Our rate of incarceration is 7 times higher than any other NATO member. Who do we incarcerate? In the late 1970’s we decided to stop treating addiction as a medical problem and to instead treat it as a criminal issue. Up to 80% of inmates have a substance use disorder. Sixty percent have a co-occurring mental health diagnosis. Cumberland County Sheriff Kevin Joyce is fond of saying that he runs the largest mental health facility in the state….and yet he has no mental health resources. Families tell him that they are glad that their family member has finally been arrested, because maybe now they will be able to get the help they need. Sadly, that is not true. We do not do addiction treatment in jails, except in rare instances, and we do not do mental health treatment. In fact, the Department of Corrections will tell you they have no budget for programming. We have so many people incarcerated, that we do not have money for rehabilitation. You have probably heard of the prison “wood shop” at Maine State Prison, but did you know that most positions there are for people who will never be released? People with short sentences will likely not receive skills training. In Maine, we release close to 1600 inmates each year. Only a tiny fraction are lucky enough to be chosen for reentry beds. Many inmates released from Maine State Prison, are given $50 and their clothes in a garbage bag when they are released. Barely enough for a day’s meals, it is certainly not enough to start a new life. Why am I here? In 2014 my son was sentenced to 20 years in prison. My husband and I had adopted him and two siblings from foster care where they had been in 5 homes in 5 years. His imprisonment began my journey of reclaiming my past and of discovering, sadly that he would not get the help he needed in prison. In fact, he would get the opposite. I hope you will join me on my journey, because in it I have discovered just why Jesus required us to visit those in prison. They are the hungry, the sick, the naked, and the strangers among us. And they are the disappeared, the people no-one sees, and the people without a voice. Please join me in prison and in giving the incarcerated a voice. Ingrid Chalufour reports that she will be attending meetings of the Brunswick Interfaith Council. Cush Anthony is involved with the Maine Council of Churches. 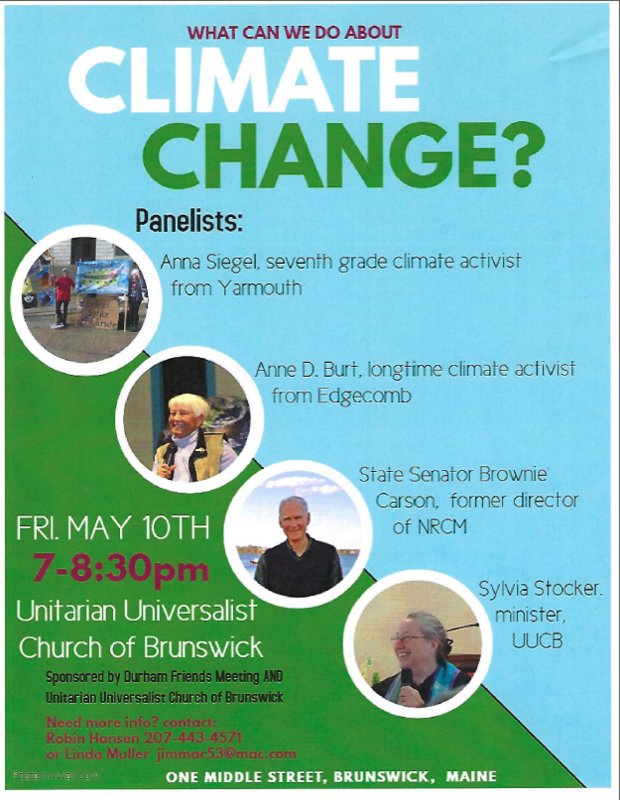 Planning of the Friday, May 10 climate change action panel discussion: Panelists will be Sen. Brownie Carson, Rev. Sylvia Stocker, and Ann D. Burt. There might also be a Bowdoin student. The purpose of the panel and the activity below is not to describe climate change or debate its existence but to talk about actions that people can take on an individual, legislative , and most importantly, organizational level. Sunday April 28 Worship, potluck and discussion: The P&SC committee is generating queries to prompt thinking and discussion about corporate witness as a Meeting. A short First Day message may spring out of the queries that will be brought into worship. Finger food potluck followed by discussion. Peace vigils at BIW: Brown mentioned that the next destroyer christening at BIW was planned tentatively for April, as well as the remaining Saturday Lenten vigils there. He brought a pamphlet about a call for a conversion to peacetime production at BIW and asked if Durham Friends would consider endorsing/sponsoring it. Sponsorship would entail permission to print our name in the flyer, display the banner at the vigil, but no financial obligation. Hal Tucker was an ordained United Church of Christ (UCC) minister and a mentor to many students at Bangor Theological Seminary (BTS) and in the UCC tradition. He was one of “Bee’s Boys” and learned to love our Quaker way during his years at Bowdoin College while rooming with Bernice (Bee) Douglas. He also served our meeting as a pastor while a student at BTS. He and his wife, Bettina, have given us many valuable Quaker books from their collection. I have thoroughly enjoyed reading one of these donated books, Living in a Larger World, the Life of Murray S. Kenworthy, who grew up in the Midwest (as did I). Kenworthy became a well-loved Quaker pastor, teacher at Earlham College, and served with the American Friends Service Committee. This book gives an insight into the development of the Quaker pastoral system and programmed meetings, and the AFSC feeding program in Russia. His son, Leonard, was a prolific writer about Quaker subjects; several of his pamphlets are on the pamphlet shelf. “Check out” these valuable books and pamphlets! Please RSVP so I can set up appropriately: marstallern@gmail.com or 207 725-4294. 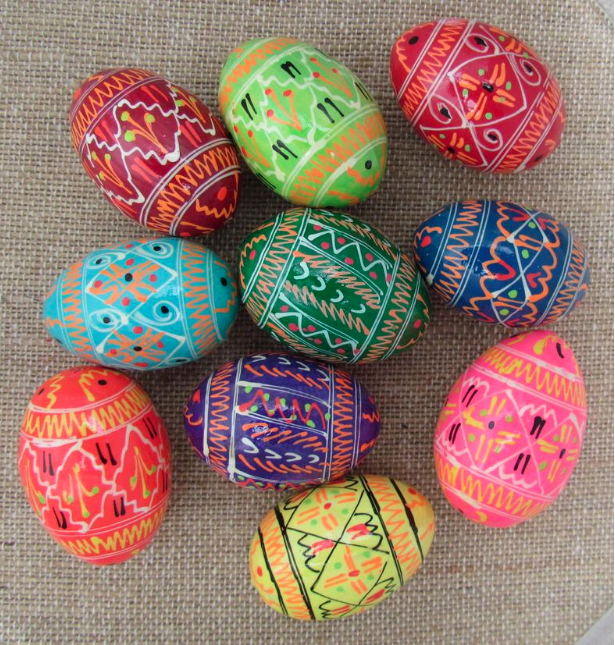 I’ll lead/teach egg decorating using the Ukrainian wax resist method. This process creates beautiful, colorful eggs AND takes patience and fine motor skills, so is for older children and adults. There will be other activities scheduled for younger children during this time. I have dyes, tools, and directions for my own and traditional Ukrainian designs, or you can do your own thing. Bring a small donation for dyes if you wish. I will bring extra eggs and candles, but if you can please bring a one or two eggs (raw, not blown out) and a candle in a holder. Take your eggs out of the refrigerator the night before. If eggs are store-bought, rinse with a solution of about 1 TBSP white vinegar in 1pint water, then rinse with clear water and gently pat dry to remove any commercial cleaner residue. If they are newly laid at your place or locally, just wash gently with water, and know that they may not take the dyes evenly until they are at least a few days old. The Gospel of John, long a favorite of Quakers, begins by saying “In the beginning was the Word, and the Word was with God, and the Word was God.” That’s an arresting way of talking about what we are seeking, but quickly John moves to speaking of the Light. John says the Word was “the light of all humankind.” Moreover, “the light shines in darkness, and the darkness has not overcome it.” Of the coming of Jesus, John says “the true light that gives life to everyone was coming into the world.” John 1:1-9. And later John quotes Jesus as saying “I am the light of the world. Whoever follows me will never walk in darkness, but will have the light of life.” John 8:12. What a remarkable gift is “the light.” How can we awaken the Light within us? How can we wait in patience till light arises out of darkness and leads us? This story resonates deeply for me. I find it really easy to look around me at things that other people are doing—really good, deeply important things—and feel like, ‘well, that’s important, so I should be doing that, too.’ It takes constant work to remember that just because work is valuable and necessary, does not mean that it is my job to take it on. Perhaps I can support the people I see doing this work in some way, but I, myself, cannot do it all. So what am I supposed to do? This is a question that has been following me around for many years now, and it resonates because I don’t have a full answer for it. And yet sometimes there are ways in which I am pulled. As Quakers, we believe that we can be guided by the inner light, if only we sit and wait for guidance. I have to admit that a lot of times, I feel like I am stumbling about in the darkness. However, sometimes, that inner light gives me a small glimmer, and occasionally that inner light shines a beacon in some direction. One of the strongest leadings I have had recently is to pursue the Courage and Renewal work—Parker Palmer’s work—that I have spoken about with all of you before. It was out of that leading that I pursued Facilitator Training, and it is that leading that compels me to stand before you here today. And I think that the idea of leadings is useful today as we continue to consider Parker’s Habits of the Heart, from his book Healing the Heart of Democracy. We must understand that we are all in this together. In past messages, I have spoken about the first three Habits (that we’re all in this together, the appreciation of the value of otherness, and cultivating the ability to hold tension in life-giving ways); these habits Parker connects with the idea of humility. Today I would like to speak about the fourth Habit—the sense of personal voice and agency—which is one of the two Habits that Parker connects with the idea of chutzpah. The first three Habits ask us to be open to the wisdom of others and to be respectful of others’ positions. The fourth Habit, along with Parker’s idea of chutzpah, acknowledges that I, too, have a voice and a perspective, and lifts up my need to be heard in counterpoint with other voices and perspectives, as part of the fabric of a functional democracy/society. Having grown up Quaker, I am grateful that I came of age in a religious tradition that honored personal agency. However, I have still struggled mightily to find my own voice. Part of this struggle comes out of being finely attuned to what I perceive others want from me and many years spent privileging those wants—other peoples’ wants—ahead of my own voice. Another part of it comes out of feeling small in a big world: In this world of so many people, why should anyone listen to me? In a society with experts who have numbers and statistics about any topic I can come up with, why should my opinion matter? Our society by and large functions on the level of the intellect. Facts and figures are used to make decisions, and there is utility in those facts and figures. However, to find our sense of personal voice and agency, I think we are asked to speak from a different place than the place of intellect, though we may draw on our intellectual knowledge as we speak our truth. I also think we are asked to speak from a different place than the place of emotion, though we may feel or describe emotions when we speak our truth. I think the place from which the sense of personal voice and agency can arise most naturally is from the level of the soul, the inner teacher, the inner light. Parker loves to lift up individuals who have found a way to align their individual wholeness with their role within society. He talks about these individuals living “divided no more” – no longer having a breach between their individual integrity, the stirrings of their soul, and the way they live and/or work. He talks about well-known individuals like Rosa Parks, and also about anonymous individuals, like a doctor who realized how torn he felt between his personal integrity as a doctor on the one hand and the quotidian sacrifices he was asked to make in his professional environment on the other. Rosa Parks, as we all know, sparked the Montgomery Bus Boycott; the doctor went on to change procedures within his medical practice—procedures that directly impacted the quality of care he was able to deliver and helped him to better uphold his Hippocratic oath. For all of the individuals Parker references, he talks about how they find their voice through listening to where their inner teacher called them. Given that a sense of voice and personal agency arises from the inner teacher, and that leadings also arise from the inner teacher, there is a strong connection between having a leading and developing a sense of personal voice and agency. Having a leading certainly lends itself to developing voice and agency. When I am pursuing a leading, I have clear ideas about why this leading is important. It is easier to speak up or speak out when I feel like I have clarity on why something matters to me. But what about all those times when my inner teacher tells me that something is right or wrong, true or not true, moral or immoral without also having a clear leading to take action or live into this belief in some new way? Do I have to have a leading in some area to be able to cultivate this sense of personal voice and agency? I do not think that is the case. While having a leading can lend strength to my sense of personal voice and agency, having a sense of personal voice and agency does not require me to be pursuing a leading in the arena about which I have a truth to share. I do not have to be actively pursuing policies that will help make life better for women with small children to be able to share the truths I have experienced about what it is like to try to navigate career and family under the current policies held in our society. I do not have to be an expert on climate change, or a leader in what to do about it, to be able to express my truth that it is a topic of great concern to me. “Zusya, why weren’t you Zusya?” Each one of us has within us a unique combination of truths that we could speak that come from the context of our individual lived experiences and the voices of our inner teachers. I do not have to try to be everything to everyone, I cannot solve all the problems, I can’t accomplish it all single-handedly. But I do have to listen for where I am called, look for where I can be of use, and lend my voice to those things that are within my realm. If I can do that, I will live into being Liana, I will speak with the voice that only Liana can speak with, I will act with the agency that only Liana can bring. What truths has your life made evident that you give voice to? What truths has your life made evident that you wish to give voice to? What leading(s) are you living into? These words have resonated for me ever since I first heard them, probably because I have spent so much of my adult life trying to find answers that have been hard to come by. In school there was an answer for everything, or at least, so it seemed. And so, as I have navigated the first nearly-20 years of adulthood, I guess it is not surprising that I get thrown off by questions and situations that don’t have an obvious answer. Rilke’s call to “love the questions,” and to “live the questions” is challenging for me because it means embracing not knowing and embracing the lack of a clear answer. But it is also liberating. It is liberating to take a deep breath and believe with certainty – even if only for a few minutes – that I do not have to answer my questions today. In my adult life one of the biggest questions that remains unanswered is a question about career path. I have always been a goal-oriented person, so my natural tendency in my 20s was to pick something and aim towards it with equal parts intensity and rigidity. On the cusp of turning 30, the economy crashed, and it seemed like all of my hard work towards a career crashed out from under me. All of a sudden I was left to consider what to do with a brand new degree in a field that simply wasn’t hiring anywhere in the country. For the first time in my goal-oriented life, I was really lost. Finding my way again has involved a certain amount of re-learning how to be in the world and how to approach navigating a path forward. In many ways, I have been living a version of what Parker Palmer would call a “tragic gap.” Parker describes the “tragic gap” as being the gap between the way things are, and the way we know they might be. In my case, this was the gap between knowing that I had all the skills to be able to land a good job and the reality of being an unemployed newly-minted dramaturg. Parker speaks often of “standing and acting” in the tragic gap—being able to hold the tension between reality and possibility in a way that can open up a new and different way forward. Standing in a tragic gap and holding that tension is hard. It means resisting being pulled towards either pole of the gap: not resigning ourselves to the way things are or giving into cynicism and disengagement on the one hand; not allowing ourselves to escape into excessive idealism or fantasies on the other hand. The challenge of standing and acting in the tragic gap is as relevant in the ways in which we interact with society as it is in our personal lives. I know that there are many people in this Meeting who are probably standing in their own version of the tragic gap as they work on societal, political, and global problems: climate change, gun violence, immigration, education. The list could go on and on, the relevance of the idea of the tragic gap has no limits. This tension-holding, this standing in the tragic gap, is tremendously challenging. It means having to let go of preconceived notions of what is best, of what the path forward should be, of thinking we have the answer. Sometimes we may have the answer, but I think that holding tension in live-giving ways demands of us to let go of our answers for a little while and be able to live in the questions. When we can live in the questions, and love the questions, as Rilke exhorts his correspondent to do in ‘Letters to a Young Poet’ we expand our capacity for listening to other answers. In listening, to both ourselves and others, we may be better able to walk the line between the poles of a tragic gap, finding a new way forward. (1) What questions are you living at this time? (2) In what place are you standing that will not allow flowers to grow? (3) What doubts and loves help you dig up the world? In worship last week, Keith Harvey brought us a message that began with a story about Jeremiah. He then gave us examples of Jeremiah figures from more recent times: people like John Woolman and Martin Luther King, Jr. Individuals who spoke their truth, even when the views they expressed went against the grain of society. John Woolman is a figure whom Parker Palmer lifts up at the beginning of his book, Healing the Heart of Democracy. Parker explores how Woolman provides an example of how an individual can hold the heartbreak they experience due to the conditions of the world in such a way as to enable continued wrestling with an issue. Woolman, traveling among Friends to speak out against slavery, continued to speak his truth even when his perspectives weren’t immediately adopted by the community. The community, meanwhile, didn’t shut him down. Woolman influenced many Friends to free their slaves, and over the years his testimony contributed to a shift in perspective on slavery in the Religious Society of Friends. Though society has changed since Woolman’s time, our polarized society has a desperate need to learn to embrace the kind of tension-holding that Woolman and the Religious Society of Friends exemplified in the 1700s. Quakers have done this tension-holding for over three hundred years in our consensus based system. Somehow we need to model that in our majority-rule based society. Parker believes that individuals from diverse backgrounds can better hold tensions in society through developing what he calls the Five Habits of the Heart. Taken together, these habits embody what Parker terms as chutzpah and humility. By chutzpah Parker means knowing that I have a voice that needs to be heard and the right to speak it. By humility, he means accepting that my understanding of anything is always partial (and may not be as true as I believe), and that I therefore need to be willing to listen to the perspectives of others. He links the first three habits—we are all in this together, an appreciation of the value of “otherness,” and the ability to hold tension in life-giving ways—with humility, and he links the last two habits—generating a sense of personal voice and agency, and strengthening our capacity to create community—with chutzpah. Yet each of the habits grows into and out of the others in a web of interconnection. In today’s polarized political climate, with all of the challenges that we face as a society, country, and world, I often feel like developing my sense of voice and agency is the most important thing. Certainly being able to stand up for what I believe in is important. Just as John Woolman did, we each need to speak truth as we see it. At the same time, I need to be able to listen to others who see the world differently than I do—and to listen deeply, with a willingness to learn—especially when I think, or even know, that I am right. Listening can be hard. Listening can be really hard. Even on the level of our closest relationships, listening can be hard. When I believe I know the truth about something—whether it has to do with politics or what happened last summer—and my partner has a different perspective, it is really hard to listen and not just try to convince him that I am right. Parker believes that most of our interactions play out this way—we listen in order to respond and in order to rebut. Sometimes in normal conversation we get so carried away with formulating our responses that we’re not even really fully listening. Through my retreat facilitator training with Parker and other leaders from the Center for Courage and Renewal, I have learned how much listening can impact a relationship. And the kind of listening that is the most impactful is deep listening—listening with the intent to hear and understand someone. Deep listening is different than listening in order to respond with answers or opinions. It is really different than listening with the intent to frame a counter perspective or convince someone of something else. Deep listening humanizes people. As I have sat in Circles of Trust (the retreat model developed by Parker), I have been privilideged to experience the humanity of total strangers through deep listening. Often, through deep listening, I am able to find pieces of others’ experiences that resonate with my own lived experiences. Always, through deep listening, I am able to find deep compassion for the human beings sitting in the circle with me. So I see deep wisdom in Parker’s call to cultivate the habits of the heart that connect to humility as an integral part of the fabric of community. And so, today, I invite you to reflect on the first two of the habits of the heart. Habit One: we must understand that we are all in this together. We are dependent on the same resources, linked by interconnected social and political structures and policies, affected by the same economic and environmental crises. This doesn’t mean that we all experience these things in the same ways, or that political, economic, and ecological change affect us all in the same way. Nor does it presume equailty in our experiences. But we are all affected, for better or worse, in interconnecting ways. When in your life have you connected with a stranger due to a shared experience? Where in your life have you experienced people coming together across differences? Alongside those considerations, I offer you Habit Two: we must develop an appreciation of the value of “otherness.” Though we are all affected in interconnecting ways, our lived experience is in smaller groups that have distinct ways of being in the world and that hold different perspectives and beliefs. This habit encourages us to practice hospitality and to embrace what people from groups different than ours have to teach us. Perhaps more than any other habit, this one requires us to practice deep listening. So the question I offer you related to this habit is: When in your life have you deeply listened to another’s story? Recognizing our interconnectedness and valuing different perspectives, beliefs, and ways of being in the world aren’t in of themselves going to bring us to consensus on difficult issues. However, cultivating these two habits of the heart may help us to connect with people who are different than we are, to hear their stories, and to begin to identify the places where we might hold some amount of common ground. It is a beginning. When in your life have you deeply listened to another’s story? In 2018 the State of our Society at Durham Monthly Meeting of Friends was healthy and thriving. We gather at our old brick Meetinghouse from towns north, south, east and west from Durham, forming a community grounded in a vital worship life that that both gives and receives strength from a range of other activities in the Meeting. We are still feeling our way, but more confidently, in our second full year of proceeding without a paid pastor. Ministry and Counsel has accepted new responsibilities both for the worship life of the Meeting and for pastoral care of members and attenders. We love receiving messages from one another, sometimes in linked themes across weeks, and also as each individual is led. We also have been much enriched by invited message-bringers from outside the meeting. We continue to reserve 5th First Days in a month, when there is one one, for unprogrammed worship. We have been adjusting our regular schedule to accommodate expressed needs for more gathered silence during Meetings for Worship. All of us are still not completely comfortable proceeding without a pastor, but we are finding ways to have various committees and individuals do what a pastor once did for us. An ad hoc committee appointed in 2017 led a yearlong consideration of the issues in proceeding without a pastor. We asked ourselves, what can we do to strengthen the Meeting? We came to focus on three needs to which we need to be attentive: pastoral care, outreach and coordination. Without a pastor, each of these areas is an important function with which we may struggle if we do not fresh approaches. An adult Sunday school meets regularly and we have been experimenting with prayer circles. Our membership numbers have stayed relatively constant with a few passings and a roughly equal number of new members. Nearly every week we have visitors. We average 30 to 40 in worship each week except in the summer when, with one and another of us scattered to other Maine pleasures, numbers are a bit lower. We meet for business regularly and appreciate an excellent monthly newsletter. Ministry Counsel has taken on responsibility for pastoral care of members. Having this as a committee responsibility rather that mostly relying on a pastor has been an important challenge. We have developed an organized approach to seeing that we are attending to all expressed needs. Some of us are still learning to see a visit from a fellow member rather than a pastor as pastoral care. We take delight in the presence of children among us and are grateful for the creativity and care of our Youth Minister. We provide childcare every Sunday, and children’s programs on 1st and 3d Sundays. Our Christian Education Committee continues to be a source of vitality for the whole Meeting. It has developed an inter-generational approach to reaching out to families and provides spiritual nurture to youth through Godly Play and Young Friends seeking. CE also arranged a series of Game Nights for children of all ages and these will continue. Through our budget and extra efforts we arranged support for several children to attend Friends Camp. We aim to make a difference in this world guided by the Spirit, love and our understanding of scriptures. Our Peace and Social Concerns Committee has new members and new energies for a variety of initiatives. The Kakamega Orphan Care Center, Lisbon Area Christian Outreach’s food bank, witnessing for peace at Bath Iron Works, a quilting project to address gun violence, the American Friends Service Committee and Seeds of Peace camp all received our attention and support. Towards the end of the year, P&SC arranged a thought-provoking social justice film series. Our Trustees have been faithfully attentive to caring for our Meetinghouse, horse shed, parsonage burial grounds, and phone/internet service. Each has needed and received attention. Our Finance Committee and our Treasurer have the Meeting’s financial house in good order. We vexed ourselves with disagreements about whether and which clock to allow in the Meeting room but we appear to have found a solution. We share the Meetinghouse regularly with a 12-step Group and a Native American fellowship group. Outreach has been a question on our minds. How can we reach out beyond ourselves to bring our message and the delights of our community to others? We have taken this on as a challenge for all of us, as we turn to a new year. Currently there are 3 of us who take turns playing the piano during meeting for worship: Dot Hinshaw, Sue Wood, and Nancy Marstaller. Dot started taking lessons when she was 6 years old. She could play by ear and found it harder to learn to read music. When she was taking lessons, her teachers would remind her to play the notes on the page! She practices all the hymns in our books, concentrating on those that might be called for in the current season. She didn’t play for worship services until coming to Durham. We’re lucky to have her with her lively playing style, especially as she can transpose a piece to make it easier to sing, and add chords and flourishes to pieces with only the melody written down. Sue also started taking lessons as a young girl. She fell in love with the organ and started playing for churches when she was in her teens. She doesn’t practice particular hymns for meeting, and likes to work on classical pieces at home. We are fortunate to have her accompany the choir too; she plays with such feeling. Both Dot and Sue choose pieces to play during the offering based on what’s said or arisen in worship. I also started taking piano lessons at an early age. I’m glad sight-reading was one of the skills the teacher stressed. When I first started playing at Durham Meeting, mostly filling in for Mary Curtis or another pianist, the pastor picked the hymns, and I chose a piece with the same theme for the offering. Now, of course, we don’t know what will be called for. It may be a piece we really don’t know, and I’m grateful no one points out all my mistakes! I practice a few pieces with the offering in mind, and may play one of them or another that seems called for by worship. I miss playing organ/piano duets with my mom. We’d love to have others play, for the hymns or for the offering. Speak to any of us if you are interested. My mom (Clarabel) and I are still collecting stamps. In January we sent off a large envelope full of your donations, and plan to send more in May. A group at Indianapolis First Friends collects the stamps and prepares them for sale to collectors. Money raised goes to the Right Sharing of World Resources program. This program works with groups of women in Kenya, India, and Sierra Leone, giving loans to start and run micro-businesses. The women pay back the loans and more groups can benefit. Check out their website to learn more. The stamp program accepts stamps of all issue dates and countries, both used and unused stamps, sheets of stamps, albums or boxed collections of stamps. Foreign stamps (excluding Canada) may be left on the postcard or envelope, especially if the envelope has some special drawing or indication of the country. There are collectors who like to receive a whole envelope or postcard with a foreign stamp. USA and Canada stamps: Cut the stamp(s) off the envelope or postcard. Leave the perforations on the stamps. Leave 1/4 inch to 1/8 inch around the stamp so the whole stamp is preserved, including the perforations. When there is more than one stamp, treat the group as a unit. Peelable stamps: Please leave these on the envelope paper. If you try to peel them off of the paper, they stick to other stamps, and damage both. Nonprofit and presorted mail stamps: All stamps are acceptable, but we want to be financially effective. If you already have a group of stamps that includes a lot of nonprofit and/or presorted stamps, just leave them and send them to us. However, as you are assembling new shipments, we recommend you leave out the nonprofit ones and the presorted ones, so you are not paying postage for something of little value. There is a box on the library table for your stamps. Keep saving them and we’ll keep sending off what we have a few times during the year. Katherine Langelier reported that the committee is very grateful for Ashley Marstaller’s presence and skill in providing childcare.The Intergenerational Game Night on January 12th was very enjoyable, and the next one will be on March 9th, starting at 5pm with a potluck supper. The committee has cleared with Trustees adding a “menstruation station” to the bathroom. This will include personal supplies such as tampons, pads, wipes, and paper towels and a more hygienic means of collection like a small, covered, and lined container for disposal of used items. Adult Sunday School is covering the book Waking Up White by Debbie Irving. Durham Friends have been given the opportunity to co-sponsor an event with Friends’ School of Portland in their Parenting For Peace series, “Tell Me The Truth: Exploring the Heart of Cross-Racial Conversations” between Debbie and Shay Stewart Bouley on May 1st. Christian Ed requested funds to share in the cost of co-sponsoring, and it was suggested and approved that the $100 be split equally between the budgets of Christian Education and Peace & Social Concerns. Leslie Manning volunteered to sit at a table representing Durham at the event. Christian Ed will be coordinating with other committees including Ministry & Counsel to plan a Homecoming Sunday on World Quaker Day, the first Sunday in October. A key feature of the day will be sharing stories from the life of the meeting in the past. The committee invites everyone to help with preparations for this special occasion. After devotions and business discussions we continued sharing informally and enjoying refreshments provided by Clarabel and Nancy Marstallar. We appreciate the addition of Nancy Marstaller to the committee in 2018 and look forward to the addition of Ellen Bennett in 2019. Many Quaker books were added to the library, donated from a retired Friend, and four books were purchased from the United Society of Friends Women International reading list. We included Library News in the Durham Friends Newsletter and continue to receive Pendle Hill Pamphlets and Quaker Religious Thought pamphlets. We will compile a list of books we would like to have in the library and ask Friends either to purchase or donate any they can. We always appreciate recommendations and look for special books that people would like to donate. A good place to look for possible additions to our library is Friends’ Journal annual book review issue. In addition, we thinned the collection some, giving a few books to Kristna Evans for the Vintage Quaker Books collection, and selling a few, taking in $50.00. As with last year, we are looking for a table on which to put the card catalog to make it easier to use. And we hope people will take advantage of this singular meeting resource, as well as continue to make suggestions for how we can best serve you. Margaret Wentworth, Dorothy Hinshaw, Ellen Bennett, Nancy Marstaller, and David Dexter. Today I would like to talk about shame. As a counselor I deal with lots of shame in the people that I work with. Shame binds us and closes us down. Jesus went to the mount of olives. At daybreak he appeared in the Temple again: and as all the people came to him he sat down and began to teach them. So lets just a pause there for a moment we are talking about the Jewish temple at the time and the fact that Jesus is sitting down teaching. He knew this could challenge the authority of the Pharisees. Yet Jesus is there and starts to teach. So lets see what happens next. The scribes and the Pharisees brought a woman along who had been caught committing adultery, and making her stand there in full view of everybody. So rather than dealing with there frustration with Jesus teaching in the temple we now have the full display of a woman who is accused of committing adultery. What a wonderfully unhealthy way to deal with the issue of who has authority head on. They say to Jesus, Master, this woman was caught in the very act of committing adultery and Moses has ordered us, in the law to condemn women like this to death by stoning. They asked him this as a test, looking for something to use against him. If there is one of you who has not sinned let him be the first to cast a stone at her. After this the bent down own the ground and continued writing and they all left one by one beginning with the eldest until Jesus was alone with the woman who remained standing there. He looked up and said where are they. Has none condemned you. No sir she replied. Then neither do I condemn you. Go away and don’t sin any more. Jesus calls them on the fact that they are human and have all sinned. With the woman he refuses to condemn her. In essence Jesus is saying we are all human and are not perfect and need to be willing to look at ourselves. I don’t know about you but I would love to be perfect, however I keep discovering over and over again that I am human. Leaning and growing are part of the human condition and that growth and learning can at times be painful and difficult. The reason I wanted to look at this passage today is to look at the contrast between Jesus and the Pharisees. The Pharisees are caught up in the interpretation of the mosaic law as a way to be Holy and separate in order to justify everything and potentially anything. Jesus on the other hand refuses to condemn. Jesus refuses to cast unfavorable or adverse judgment. Jesus refuses to be at a distance and releases this woman. In another biblical story Jesus asks for a person to be unbound. How often do we separate ourselves from the human condition? I am so glad I am not them. Guess they made their bed and have to lay in it. The thing we have to come back to is the fact that we are all a part of the human condition. We can insulate ourselves with objects, excuses and platitudes but we all are human and imperfect. The reason I am bringing this forward is this is the basis of shame. If you did this “right” you would be ok in my eyes. But you did not do this right therefore, I get to throw stones at you? I get to accuse you because now I have more power than you do. This is what shame looks like. When we take power away from others and call them bad and demand that they justify themselves to us. So you might say not me, I would not do that. How often do we put ourselves above others and tell them what they need to do to be acceptable in our eyes. Our mother, father, sister, wife, husband friend, coworker. We separate rather than deal the fact that something is uncomfortable her and we have run smack dab into the human condition. It is much easer to separate than own. It is much easier to push away than to come along side. We are all human fall short and in some way are capable of hurting each other, what do we do with that? The first step is to come along side rather than hover over. To recognize that we are both human. It might look something like this, I deeply respect you even though I am mad at you because you did something that is human and I got hurt. I do not condemn you, how can were work on our connection so we do not hurt each other. I am proposing here that sin is our own unwillingness to own our discomfort rather than choosing to talk about it in a way that respects the other person. This means that as I face the other person I am also facing myself and my need to justify being right. This means I am willing to face the way that I am disconnecting from those I care about in order to be right. My husband David will sometimes confront me on a way that I acted that is self-centered. One of those times that I poured myself coffee and not him at breakfast. My first response is to be defensive and say that does not matter because that is a little thing and after all he could pour his own coffee. In actuality it is a big thing because our relationship is built on a deep respect of one another and acts like being of service to each other are a part of our day-to-day relationship. I am called to see him as a sacred person that I have chose to be in relationship with and to respect what the two of us have agreed that means day to day. He gets to call me out. He gets to say you are human and I deserve to be respected and he is right. Just as I get to call him out when I am not feeling respected. When I start to move away from that deep respect of David begin to walk away from the human condition and say things like I am better him because I can do some things better. It is at this point I have to stop and remind myself we both have gifts that are different and I need to respect and honer his gifts just as much as he needs to respect mine. In doing this a sacred closeness and emotional intimacy continues to develop that says, I will always respect you even when it is difficulty to do so. I am always willing to learn about the human condition from you even when it is difficult to do. The key is asking the other person to be with us in the same place of learning rather than telling them what to do. Calling the other person to be present at the same level. Letting go of the need to be right in order to connect at a deeper level. This means listening evening when its hard to listen. This means I might be wrong and might need to look at things from another point of view. This means I am willing to learn new things about myself that I might not looking at. This means I choose to own rather than shame. Connect rather than distance and love rather than condemn. My mother likes to say that we live in the awkward place in history between the already and not yet. It is in this place that we are 1000% human. In being human we are vulnerable, naked and easily hurt, yet can love each other in ways that can be immensely powerful. So in good Quaker tradition I want to leave you with some questions. Who is the person or persons that you have committed to treat in a sacred way? How do you show that deep respect and ask for it in return. What is the way that you tend to separate yourself from others as the them, or the other? Can you think of ways that you can treat other in your life with deep respect, listening to them, holding and honoring them and asking them to do the same even when it is difficult? May the God who created us be honored in the sacred way that we treat each other. There will be a Lenten Vigil for Disarmament from 11:30 a.m. to 12:30 p.m. Wednesday, March 6 and Saturdays March 9-April 20, at the Bath Iron Works Administration Building, 20 Washington Street. Please join us to hold the hope for resurrection, renewal, recovery as we say No! to endless war. For more information, contact Smilin’ Trees Disarmament Farm at 763-4062. We discussed the importance of addressing climate change, the real crisis right now. We would like to put together a panel to help us move toward taking collective action. We would like to collaborate with another group(s) on this and are looking for partners. Ingrid Chalufour has volunteered to represent the Meeting in the Brunswick Area Interfaith Council. The recently revived group meets monthly. This might be a path to finding collaborators. As a follow-up to the American Friends Service Committee discussion about action priorities we are planning events for April 28, the last Sunday in April. Our committee will give the message that day and facilitate an after-Meeting discussion. We have agreed to host a Peter and Annie Blood concert in May at the Meeting House. They have a new Pete Seeger songbook they will be using for the concert. The next intergenerational game night will be Saturday, March 9, 2019. We will begin with a potluck supper at 5pm. This has been a lot of fun for everyone whether playing games or getting a chance to hang out and visit. Hope to see you there! Contact Katherine Langelier if you have any questions. Durham Monthly Meeting of Friends convened in worship for the conduct of business on Sunday, February 17, 2019 with 16 people present. 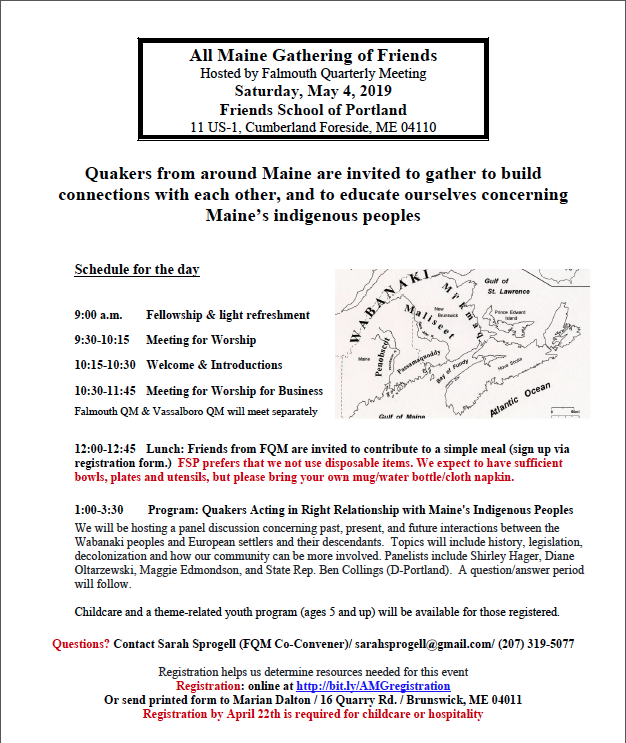 Clerk Susan Rice opened the meeting by reading from the 1985 New England Yearly Meeting Faith and Practice, “The Quaker Method of Making Decisions”, p. 115. There was no monthly meeting in January due to snow. 1. The December 16, 2018 minutes were approved. 2. Ministry and Counsel: Martha Hinshaw Sheldon reported that Ministry and Counsel met in January and February to discuss worship, pastoral care concerns and opportunities, and new members. They received a letter requesting membership from Cushman Anthony who had been a member of Portland Friends Meeting in the past. A clearness committee met with Cush and recommend that he be received into membership at Durham Friends Meeting. Ministry and Counsel enthusiastically approved this recommendation and sent it on to monthly meeting for final consideration and approval. They will continue to suggest a theme for worship. Those bringing a message may choose the theme, “Leadings” for February and March. They report that Ralph and Twila Greene have found a stable home into which they moved this month. They are thankful for those who stepped in to help resolve this concern: Nat Shed, Nancy Marstaller, and Edwin Hinshaw. 3. We enthusiastically approved welcoming Cushman Anthony as a member of Durham Friends Meeting. 4. Nominating Committee: Margaret Wentworth and Jo-an Jacobus reported that the list of committees and officers is almost complete with a few changes and corrections. The corrected report will be included in the Newsletter and attached to these minutes. We expressed our thanks to the committee and to Jo-an who is leaving the committee. 5. We approved the Nominating Committee report with corrections. 6. Trustees: Leslie Manning reported that there is no report this month; Kitsie Hildebrandt, Treasurer, reported trouble with the heating system at the parsonage which has been resolved thanks to the help of Craig Freshley. An insurance claim has been filed. 7. Communications Committee: The committee met on Wednesday Feb. 13, 2019. Jo-an Jacobus will be stepping down as Newsletter Editor. Her last month as Newsletter Editor will be April 2019, when she will assemble the May 2019 newsletter. The committee does not yet have a replacement. Jo-an reported that the hardest tasks of getting the newsletter out are 1) getting information from the meeting and 2) getting messages for the first page. Doug Bennett will assist in getting all the needed information from the various individuals and committees through April. We expressed much appreciation for the hard work that Jo-an has performed as editor of our newsletter: The Best of Friends! 8. Christian Education Committee: Katherine Langelier reported that the committee is very grateful for Ashley Marstaller’s presence and skill in providing childcare. The Game Night (afternoon) on January 12 was very enjoyable, and the next one will be March 9. 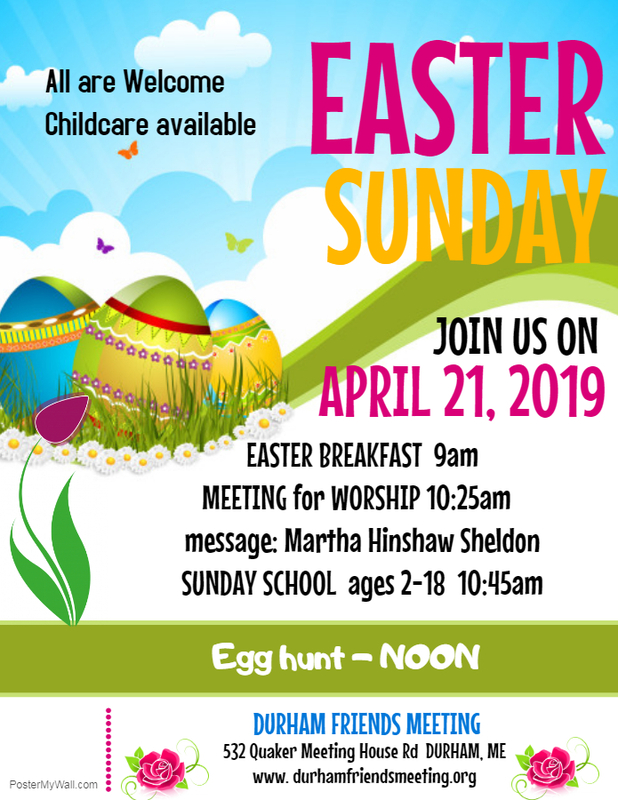 Plans are being made for an Easter celebration. They plan to participate in an event with Portland Friends School’s Parenting for Peace series, and request funds to co-sponsor the program. Leslie Manning volunteered to sit at a Durham Friends Meeting table at the event. We endorsed the exciting plan of a World Quaker Day Homecoming Sunday on October 6. Plans for these activities will be included in detail in the Newsletter. The committee expressed appreciation for the joyful noise of small children. The Adult Sunday School Class has been and continues to read Waking up White by Debbie Irving. 9. We approved the expense of $50.00 each from Christian Education and Peace and Social Concerns Committees to cover the cost of co-sponsoring the Parenting for Peace event. 10. Peace and Social Concerns: the committee welcomed new members Bob Eaton and Cush Anthony. They reported that the film series and the Seeds of Peace events were very meaningful but not well attended. They discussed possible spring events and the importance of addressing climate change, the real crisis right now. They hope to put together a panel to help move toward taking collective action. They would like to collaborate with another group(s) on this and are looking for partners. Ingrid Chalufour has volunteered to represent the meeting at the Brunswick Area Interfaith Council which meets monthly. They are planning an event for April 28 as a follow-up to the American Friends Service Committee discussion about action priorities. The committee will give the message that day and facilitate an after-meeting discussion. 11. The Library Committee gave their annual report which is attached to these minutes. 12. A thank you letter was received from Lisbon Area Christian Outreach for $355 donation to the food pantry from the parsonage garden profits; they report that they serve between 250-300 families a month. 13. Leslie Manning reminded us that members are needed from our meeting to serve on the New England Yearly Meeting Nominating Committee and the Yearly Meeting Ministry and Counsel. 14. Much appreciation was expressed for Andy Higgins who has been offering his services to plow and mow for us without any charge. The meeting closed at 1:58 p.m. in the Spirit, in appreciation for God’s guidance. I woke up with a set of expectations this morning. I knew I would rise before the sun, do some gentle yoga, eat breakfast, drive here and spend the morning with all of you. I knew I would be nervous but grateful to share this message. And I knew that, there is always more that I don’t know than I really do know. That’s a little unnerving – but it’s also exciting. This morning, I trusted that in my not-knowing, I would be met by your open hearts and open minds… After all, you didn’t know what to expect from me either. When people come together in mutual unknowing, as we have this morning, our limits dissolve and a new space emerges, a grace-filled space where Love has room to work amongst us. In this space, speaking meets listening, giving meets receiving, and past and future dwell fully in the present…I would like to illustrate this idea. About six years ago, my Dad retired. His already quiet and reclusive life seemed to become increasingly isolated. He stopped visiting family members and meeting friends for golf or lunch. He began to lose weight and became nervous and tentative. He said he was happy, but he didn’t look or act like he was. When Dad invited me to attend a routine exam that required anesthesia and a driver, I had a chance to step in a bit.Dad was so grateful for the practical support I offered on that visit that I began visiting for one extended weekend per month. Together we sorted mail that had accumulated, paid bills, did laundry, went grocery shopping, and attended appointments. We also made time for long walks, healthy meals, and plenty of laughter and conversation. On one visit, I arrived late due to a rainstorm and Friday night traffic. I had called dad a few times to give him updates and offer a revised ETA. When I arrived, Dad was peering through the window by the door. He gruffly asked what took me so long. Exhausted from the drive and unprepared for this icy reception, I snapped back – something about traffic and calling a half-dozen times – and then caught myself. He had probably been waiting for some unknown visitor for my entire 5 hour drive. No longer able to track time, he could not possibly interpret the meaning in my phone calls. Maybe he also could not connect my voice with my face or my presence. Dad had begun to live in the unknown all of the time. Dementia was robbing him of capacity to understand, sort and organize experiences, people, objects and events. For him, every moment was a step into an unknown. After hitting dead—ends trying to get information and support from my Dad’s doctor, I scoured the internet and the library shelves for help. I wanted a definitive medical authority or a rule book, the equivalent of a map and compass that would tell me where on earth we were and where we were heading…And while I did find some resources that offered clues and perspective, I never found an outside authority that I could really settle into. But, I found my Dad – obscured by his illness but patiently and persistently kind, loving and intelligent. And I found myself. Even better, I found that I was enough. While I had been looking to the world around us for guidance, I was also just spending a lot of time with Dad. As we navigated challenging, curious, and mundane details of life together, our relationship was deepening. I was learning to dwell with him in the unknown – and in the sacred space that formed between us, there was safety, love, trust, and joy sufficient to carry us both along the challenging path that unfolded over the next few years. As Dad became less verbal, we often walked together in silent communion. If Dad felt like making conversation, he would ask, “So, what have you been up to?” After I answered, we would often fall into silence again. Within a few minutes he would ask again, “So, what have you been up to?” He never remembered asking and remained as genuinely curious and interested on the 5th asking as he was on the first. Each asking became an opportunity for me to share a bit more deeply about my life. Though he didn’t remember my responses after a few seconds, he listened to each one with real interest and attention. I offered new responses each time he asked. “So, What have you been up to?“ It was like an invitation to peel away the layers of my life like an onion, sharing myself ever more deeply, while pulling Dad in closer. As special as my relationship with my Dad was, it does not need to be unique. We don’t need to wait until dementia or any other life change nudges us into deep, loving relationship. Humans are social creatures. We are meant to step in close, to walk through the peaks, valleys, and meadows of our life with others. We can practice a more intentional engagement with everyone we are in contact with – it’s as simple as a smile, an open hand, a moment of vulnerability, or an act of generosity. We will suddenly notice that there are fewer strangers around us and more friends. And we notice that the lines that separated us get a little blurry. The distance between us grows smaller and less significant. When we honor the unknowing between us with open hearts and open minds, we create that nurturing grace-filled space where Love flows freely, speaking meets listening, giving meets receiving, and past and future meet the limitless present. We meet there in worship. Let us meet the wider world there in our words and our actions too. The story is presented to us in a way that says God spoke to Samuel. God did not speak to Eli or to his wicked sons. But I’m not sure that’s how we should hear it. Here’s another story, one especially important to Quakers. The times are troubling. There’s war, there is inequality, there is corruption and deceit. Sound familiar? A confused young man, let’s call him George, is trying to understand how to be a good person, how to know what God hopes he knows and how to do what God expects him to do. He asks a lot of wise people (let’s call them the Elis of this world) to help him figure this out, but they don’t prove much help. Then one day George is out for a walk, a long walk, wondering, thinking, praying, and he hears a voice say to him “There is one, even Christ Jesus, that can speak to thy condition.” That George, of course, was George Fox. The year was 1647; Fox was 23. And so begins the movement, the spiritual revival we call Quakerism. We gather here today and every first day inspired by that Leading. What Fox hears that day, what Fox realizes, is that God will speak to each and every one of us, if we still ourselves and listen. This suggests a different slant on the Samuel story, I’m thinking. It is not that God spoke to Samuel and not to Eli and not to Eli’s wicked sons. It’s rather that Samuel heard what God was saying, and Eli and his sons did not. God is talking to all of us all the time. That is what George Fox realized. We gather here each Sunday in that confidence, that God will speak to us if we still ourselves and listen. The question is, will we listen? Can we hear what God is saying? How do we hear God’s call to us? It is clear we can miss it. That’s the main burden of the Samuel story. Samuel was in the best place, right there at Shiloh, but he was still confused at first. How do we prepare ourselves to hear God calling? Eli helped Samuel hear what God was saying. Perhaps we can help one another. My friend and mentor Paul Lacey wrote a wonderful Pendle Hill pamphlet on “Leading and Being Led.” He uses another example to understand leadings: the example of John Woolman. Woolman was an 18th century Quaker who was among the first to call attention to the evils of slavery and to press his fellow Quakers to renounce it as well. And Woolman made striking efforts to befriend the indigenous peoples of North America. There will be no Meeting for Worship, Sunday School classes, or Monthly Meeting at Durham Monthly Meeting of Friends tomorrow, Sunday, January 20, 2019. They have been canceled due to the severe weather expected. 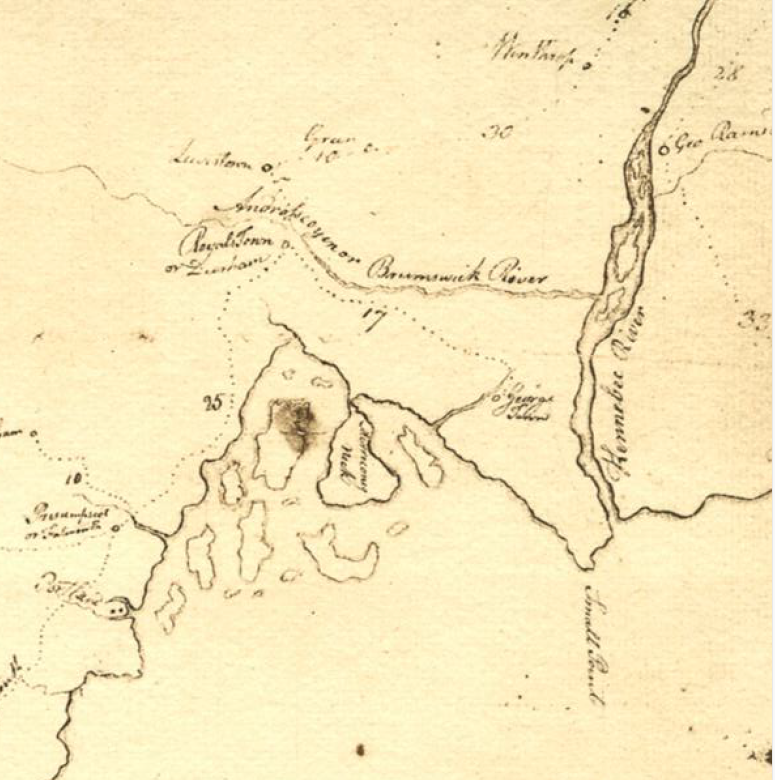 Portion of a 1782 map showing Quaker Meetings in New England. Among the Meetin gs shown is Royaltown or Durham. It is on a road 25 miles north north east of Presumpscot or Falmouth Meeting, and 17 miles west north west of Georgetown Meeting. Just to the north of Durham Friends Meeting is Lewiston Meeting. from Henry J. Cadbury, “A Map Of 1782 Showing Friends Meetings In New England, Recently Acquired By The John Carter Brown Library, Brown University,” Quaker History, Vol. 52, No. 1 (Spring 1963), pp. 3-5. On January 6, 2019, Craig Freshley brought a message on The Practical Benefits of Prayer. You can listen to this message on Craig’s website. On his website you can also see some of Craig’s favorite prayers. Next week (January 13), Craig will bring a message about a prayer he has been writing and rewriting for many years. There will be a gathering of men on Monday, January 14 at 7 p.m. Location: 64 Birch Point Road, Freeport (Scott’s house). Topic: justice. We’ll have a reading or two beforehand that we’ll be discussing, so please email Scott (stbark7@gmail.com) to get a copy of it. If there are slippery conditions, we’ll be meeting at the Meetinghouse instead (we’ll decide by meeting the day before). Thanks!